Jerry Mntonga and Osei Mpho-Tutu as The Man. Photograph by Ruphin Coudyzer. Something must be said for the unequivocal beauty of intelligent satire handled with such vicious acuity that it makes you laugh with glee to watch morally horrifying corruption at play. 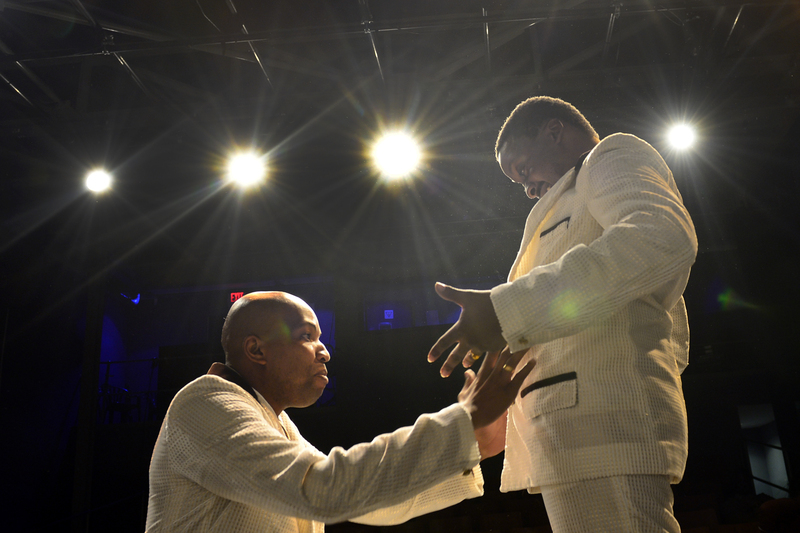 Mpho Osei-Tutu and Jerry Mntonga capture an understanding of Zakes Mda’s ‘man’ to an insightful tee, but it is the rhythm, the give and take and the idiosyncrasies of the directed performance that makes this play utterly pristine and delicious to behold. Written more than twenty years ago in Lesotho, the play is remarkably prescient within the sordid and contemporary context of corrupt government officials. But it is driven to a theatrical level of excess by the two performers who together play the main character. With his bulging expressive eyes, Osei-Tutu casts a whole universe of rhetoric and mirth, and he has the power to make you fall about laughing or grow goosebumps, with ever so subtle a twitch of a facial muscle. His character’s uproarious laughter, sometimes the fruit of terror and at other times that of bravado and forced nonchalance, lends the work a sinister and compelling tone, all at once. Osei-Tutu is like a machine of expression and you drag your eyes from him with loaded difficulty. However, when considerably younger performer Mntonga takes the stage, he does so with an enticing sense of authority. There’s a palpable collaborative generosity at play here, which is flexible and thoughtful as it is honed with a sense of dramatic contrivance. The two, forming The Man sync beautifully with one another, making you want the play never to end. But end it does, and with a moral point to bear, that is almost disappointing, given the deliciousness with which evil is handled. This play is not only about consorting with the devil of corruption: it is also about how a piano can become a cast member, knocking on the door, making the phone ring, and indeed, substituting for the voice of several characters. It is about the role of reflection on stage, and the impaling ugliness of bling in attitude. Above all, it’s delicious on the senses: beautifully crafted, thoughtfully directed, with an astute and humorous hand and eye. Quite simply, The Mother of All Eating offers a sense of theatrical rectitude: this calibre of performance is absolutely impeccable. The Mother of All Eating written by Zakes Mda, is directed by Makhaola Siyanda Ndebele, assisted by Gaosi Raditholo. It features design by Christian Haris (set and costume) and Nomvula Molepo (lighting) and is performed by Mpho Osei-Tutu, Jerry Mntonga and Bernett Mulungo on piano. It performs in the Barney Simon Theatre, Market Theatre complex, Newtown until June 1. (011)832-1641.